To join LOTS, please complete the membership form and send it, with payment, to our Wimbledon address. or £47 (£57 Europe / Rest of World) including 12 issues of 'The London Bus' and 4 issues of London Bus Magazine. 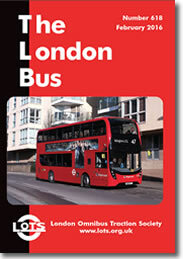 A sample edition of "The London Bus" is available by clicking here. This is an example newsletter which illustrates the vast amount of news and information delivered to members every month. (Note: Some personal details have been obscured in this on-line version). Annual subscription to London Bus Magazine is available to non-members for £24 (£27 overseas). For membership enquiries, please contact the Membership Sectretary at lotsmemsec@gmail.com .